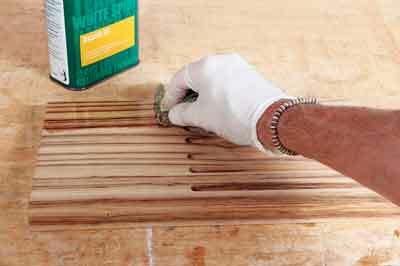 ... finish with a little careful sanding. One down, two to go! You should be able to see through the gaps; now onto the egg cup! 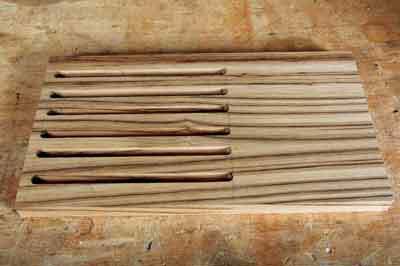 Even if you only have a few bits of timber lying around the workshop, there are still things that you can make. 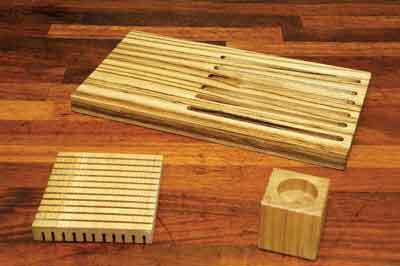 This small breakfast set needs only a minimal amount of timber and a small amount of imagination. 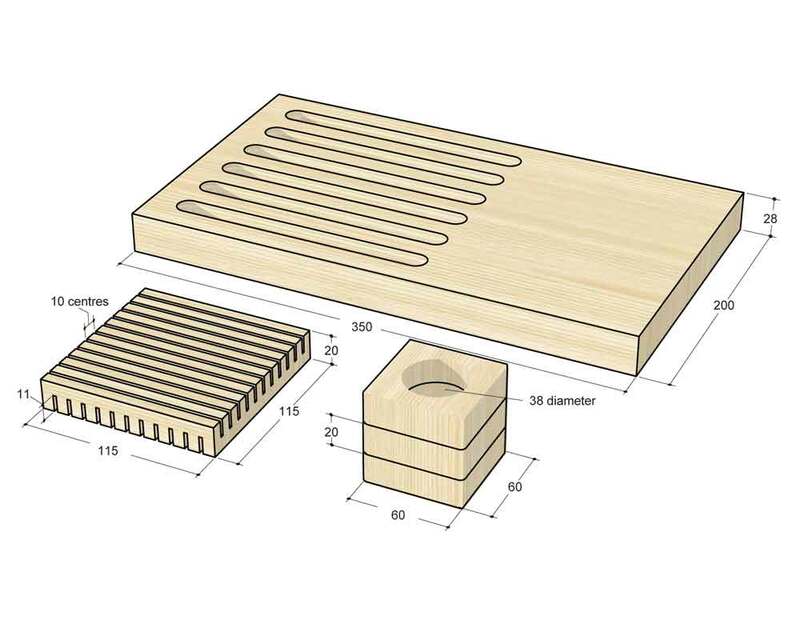 It comprises a breadboard with grooves to catch the crumbs, a mat to protect your table from hot pots or saucepans and an egg cup for your boiled egg. 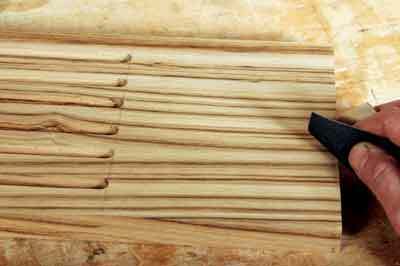 A few offcuts of sweet chestnut (Castanea sativa) were used for this project. 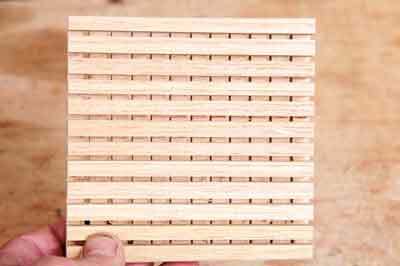 To make the breadboard, three pieces of narrow timber were glued together to make a wide board. 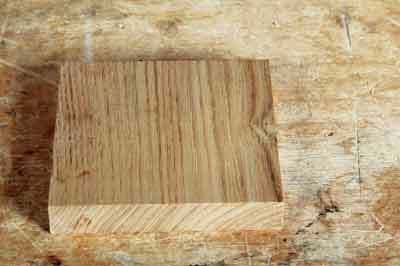 First cut the timber to length. 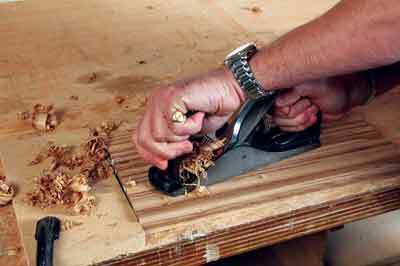 Next you need to plane the edges to ensure a neat joint. 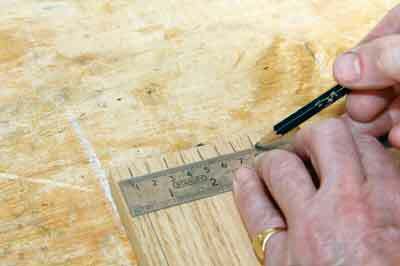 Then you can start applying glue to the edges of the boards. 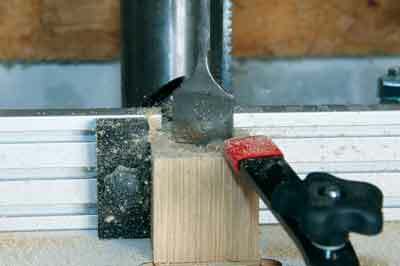 Now you can clamp up tight and leave to cure. 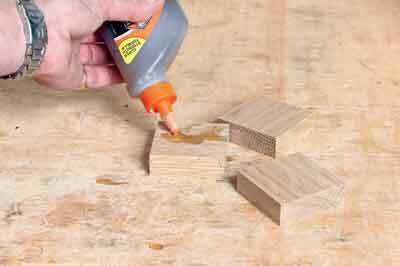 Once the glue has thoroughly set, you can remove the board from the clamps and clean up the surface with a finely set plane. 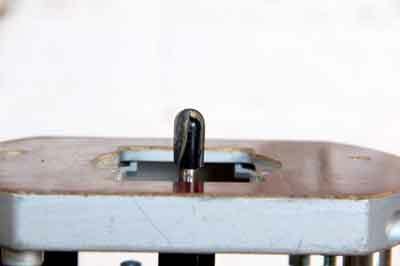 A point to point line divider was used to position the grooves on the board. 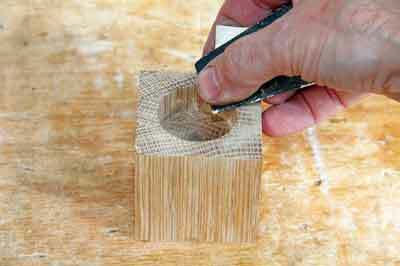 Use a core box cutter to machine round-bottomed grooves. 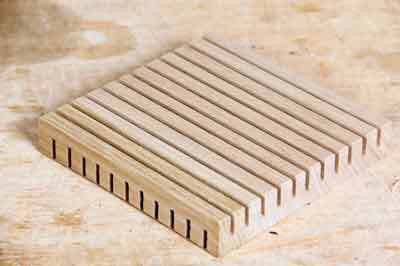 Next, a stop-block was clamped across the board, so that all the routed grooves would be perfectly level for the next stage. The finished board should look like this. 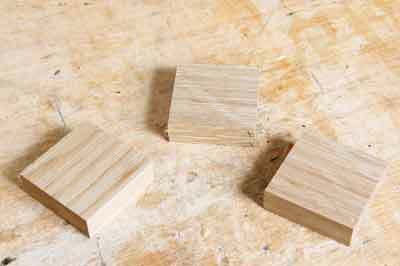 Now all it needs is a little careful sanding to remove any sharp edges and corners. 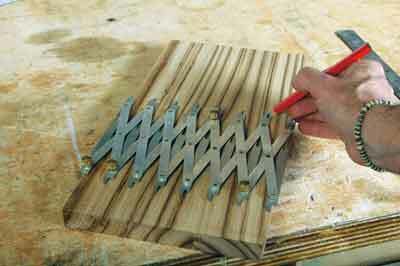 A square block is all you need to make the teapot mat. 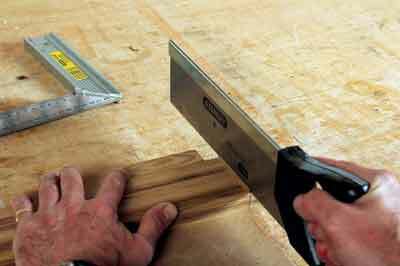 Mark out the position of the sawcuts end to end. They are 10mm apart. 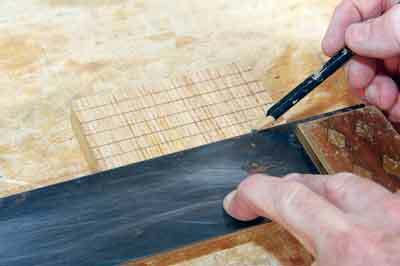 Extend the lines across using a try square. Repeat the process on the other side but this time mark them side to side. 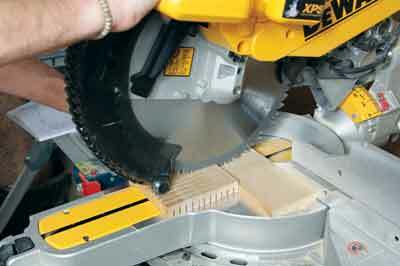 A sliding mitre saw is ideal for making the cuts for this particular step. 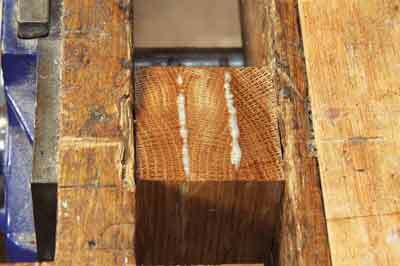 Set the depth of cut to just a little more than half the thickness of the timber. 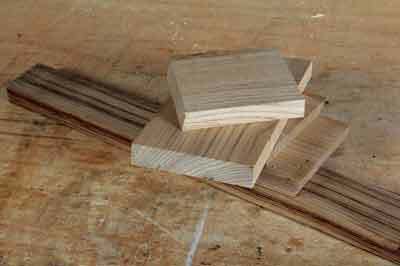 For 20mm thick timber a setting of 11 or 12mm is ideal. The completed mat which is now ready for use. You should be able to see through the gaps. 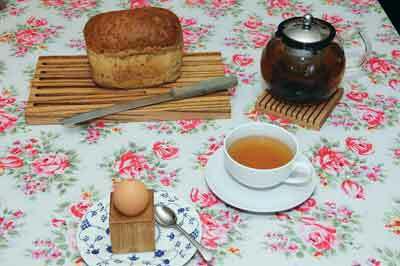 The egg cup is made from three 60mm square pieces. 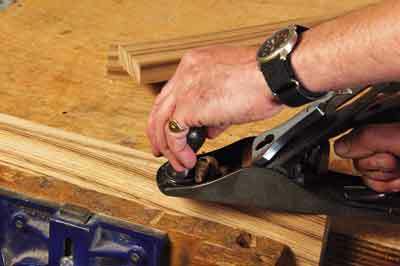 ... and clamp them up tight. 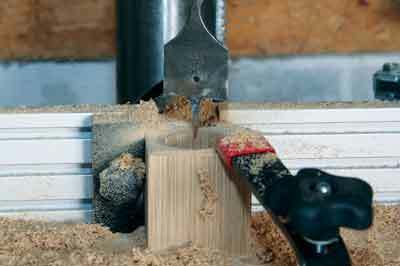 A vice is ideal for this as it is much easier to keep the pieces aligned, without slipping. 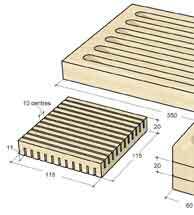 The assembled block should look like this. 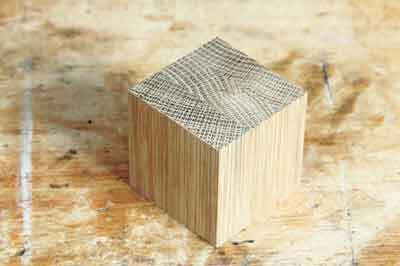 Mark the centre of the block on the end grain. 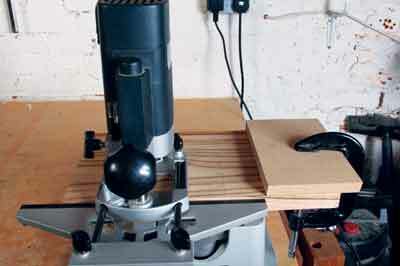 Use a pillar drill fitted with a 38mm diameter flat bit or holesaw to bore the hole. The completed hole which is now ready for sanding. 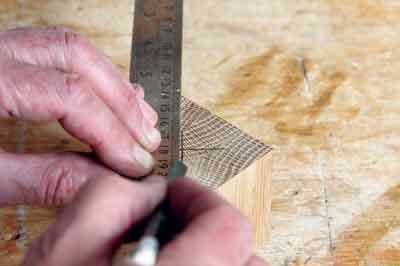 Round over the top edge of the hole with abrasive paper so that it provides a smoother edge to hold the egg. 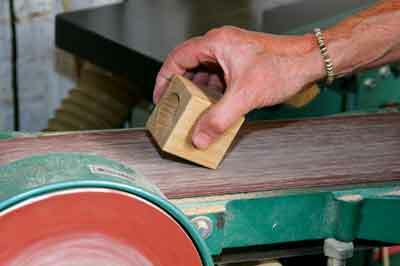 Round over all the edges of the block so that it is smooth and comfortable to hold. 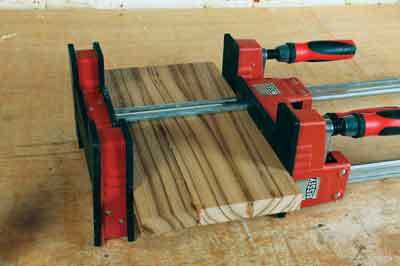 A belt sander is ideal for this. 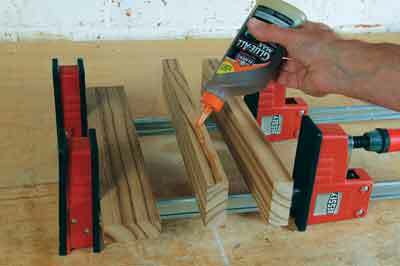 A coat of Danish oil on all the pieces will protect them and make them look good. Your finished breakfast set should look a little like this, bon appetit!